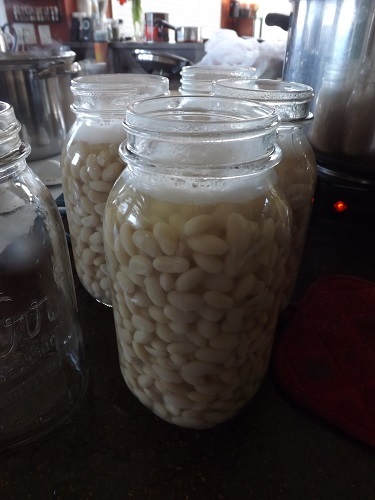 Back in March when it was too cold to garden and Hubby had just begun his experiment in retirement, I spent three days in the kitchen (while Hubby was settling in to his new spot in the office) canning bags of beans I’d accumulated from grocery store sales. I canned pinto, Great Northern, navy, and new to my bean canning roster — Garbanzo beans (chickpeas). I think in the end I ended up with somewhere around 70 jars (varying sizes) of beans. 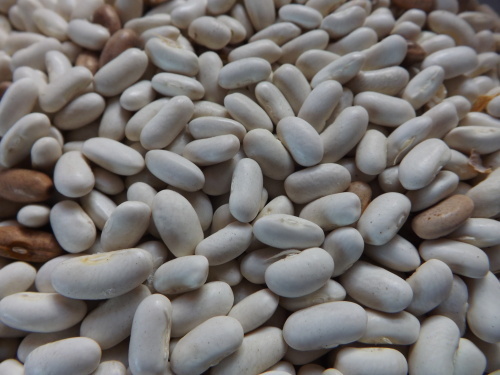 For months now I have enjoyed using these beans in various recipes and can’t say enough about how nice it is to use home-canned beans right from the pantry whenever I want. I’ve especially enjoyed making Hummus with the garbanzo beans. 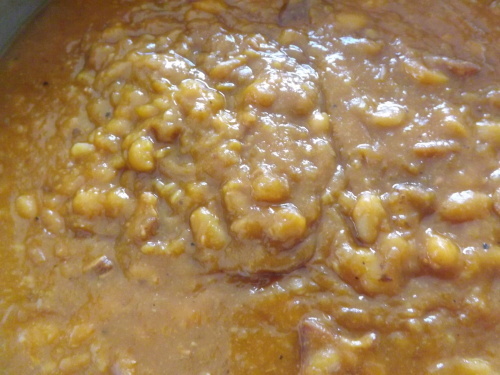 Today I made a batch of baked beans. It’s actually the second batch I’ve made this year, but although I took pictures of the first batch I neither did a post nor did I seem to find it necessary to save the recipe. I know we liked it, but I can’t cry over spilt milk. So this morning I spent several hours reviewing recipes, choosing ingredients, and then making a batch of quick, saucy beans. For the entire story and recipe check out my latest post at Simply Grateful Cooking for Saucy Homemade Baked Beans. These turned out excellent. It’s funny though, when I look back at the pictures of the ingredients I used for the first batch of beans I made, they look very different from the ones I used this time. I wouldn’t be surprised if I decide to continue my experiment with baked beans because there is always room for improvement. Losing my first recipe could be considered a bad thing, but at least I found another one that everyone liked and got to experiment with some different ingredients, and for this I am — Simply Grateful. It took me several years to get a single bean plant to grow in my garden. To my delight last year not just one plant grew, but an entire garden of them sprouted, flourished and produced beans for months. We had more beans from our plants than we could eat or give away. I canned them, froze them, ate them, and when we finally couldn’t find another thing to do with them, I looked into how to dry them. Being the frugal gardener that I want to be, I couldn’t let a single bean go to waste. 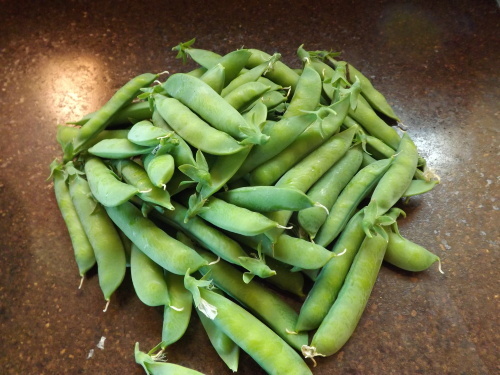 For months I let the beans sit on the plants undisturbed and at the end of October I harvested all the dry pods. Although my efforts were rewarded, they were not rewarded as well as I would have liked. Although I’d like to grow as much of our food as possible, for a suburban housewife this is one crop that isn’t worth the effort. That is at least not for the purpose of harvesting dry beans. I love having had the success last year with our beans, but I am also very content this year that my bean crop failed, and for this I am — Simply Grateful. 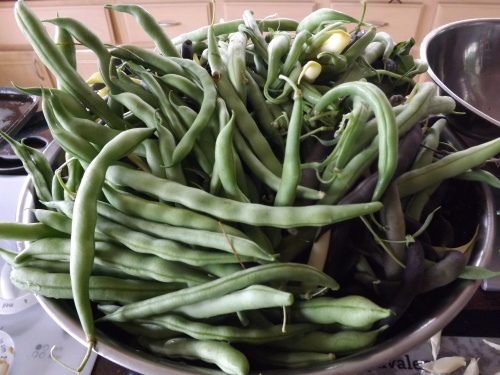 I know that must sound wrong, but check out my post at Simply Grateful Gardener To Bean Or Not To Bean for the whole story. Summer colds are the worst! Not that a cold at any time is any fun but having one when it’s hot and humid just somehow makes a stuffy nose, aching body, and fever worse. Every June and then again sometime in December I get a cold. It’s not really a cold, it’s a sinus infection, but it has all the wonderful symptoms of a cold just lasting longer. The one in December isn’t as bad, or at least it doesn’t seem as bad because there doesn’t seem to be as much a demand on my time then. In June however there is so much to do outside with the garden and inside with painting projects and other home improvements that get put off until the weather is nice that being down for even a day puts me behind. One of the best remedies for a summer, or any cold is hot soup and fresh bread. I know you might think that a hot bowl of soup on a 90 degree day isn’t comforting, but for some reason no matter how hot it is outside, that hot soup coating my throat when I’m not feeling good, picks up my spirits right away. This is where planning ahead really comes in handy. Last fall when I was canning all the wonderful tomatoes from the garden, I managed to make two large batches of Tomato Soup and freeze it for just such an occasion. This meant all I needed to do was defrost a couple of bottles, make a loaf of bread (check out my latest post at Simply Grateful Cooking for the absolute best Gougere Bread recipe), and enjoy. Does it get any better than that? Homemade soup and I didn’t have to do anything other than heat it up. I am definitely going to look into freezing more soup bases this year, as long as I can find the space. Being sick is awful but having dinner done in the freezer makes it a lot more tolerable, and for this I am — Simply Grateful. The Year of the Tomato — NOT! The color of my thumb is truly in question this summer. You know the old saying, “If you didn’t have bad luck, you wouldn’t have any luck at all?” Well that is my gardening, specifically tomato gardening life this year. From prematurely transplanting seedlings and killing them all to not hardening the second planting of seedlings off before putting in the garden to dealing with sun scald and wind damage — things just couldn’t get any worse. Or so I thought. The latest in my tomato garden saga is tomato leaf curl. What fun! 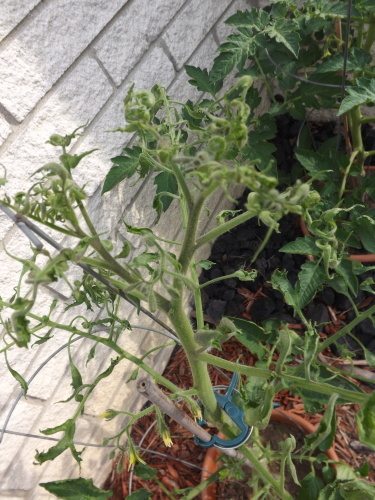 Check out my latest post at Simply Grateful Gardener Tomato Leaf Curl Quandary. I can’t tell if I’m watering too much, too little, or with my luck it’s probably a combination of the two and now I’m left trying to sort out when to water and how much. What’s left? Early blight, tomato worms, hurricane, wild-fire, earth quake? Well I say, BRING IT ON! This has definitely been a challenging year for growing these supposedly easy plants, but with challenge comes new-found knowledge which hopefully means next year I can rise above all this and have a true Year of the Tomato. For now I’ll keep struggling away until every last plant either produces fruit or withers and dies. In the end I’m going to be the foremost expert on what not to do when growing tomatoes, and for this I am — Simply Grateful. But We Don’t NEED Anymore Strawberry Jam! Where is it written that you can only make something when you NEED it? I mean honestly, just because I have a pantry with 2015 jars of strawberry jam still on the shelves, does this automatically mean I can’t make some 2016 jars? 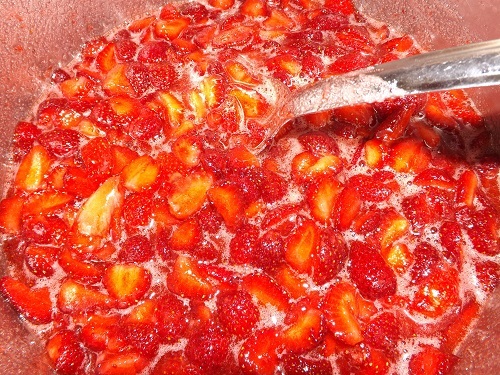 Isn’t there something about fresh-from-the-pot strawberry jam on lightly toasted bread or a hot from the oven biscuit that can’t be duplicated, even in home-canned strawberry jam. Sure I love my canned goods and am grateful the pantry is brimming with more than 70 different jams, jellies, preserves, and spreads, but given the opportunity to make a fresh batch to eat straight from the pot, I’m just going to have to do it. This year I didn’t plan on making jam, but once those berries were safely home and sitting on the counter, filling the kitchen with their sweet smell, something came over me and I found myself whipping up a batch and then two. Never fear though, the first batch was gone within hours (given away and eaten) and the second batch isn’t going to make it the pantry. Changing up last years recipe a bit yielded a jam so good, I can’t keep it from being devoured. 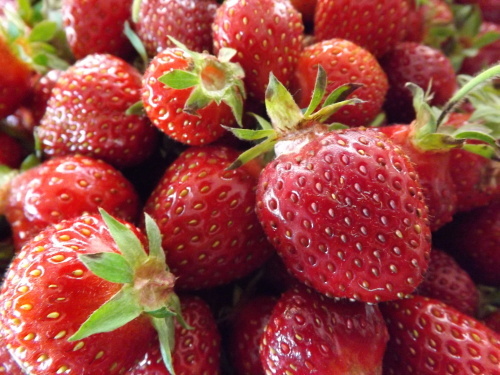 Check out my post at Simply Grateful Canning for Strawberry Jam. And for this I am — Simply Grateful. The garden is really enjoying all the hot and steamy weather we’ve been having. Most of the garden anyway. 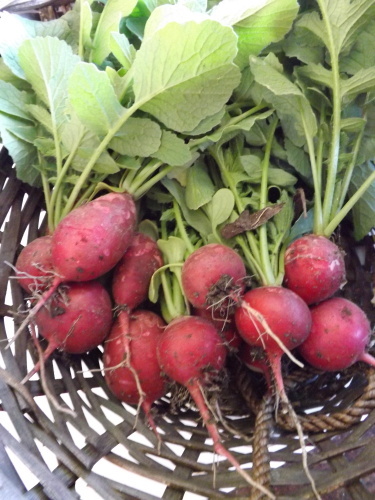 So far this June I’ve harvested radishes and peas. For more pictures check out my post at Simply Grateful Gardener. Neither harvest lasted very long once picked, but they were sumptuous. The two rows of radishes I planted all came in at once, so I only planted one row to replace them and waited another couple of weeks before planting the second. 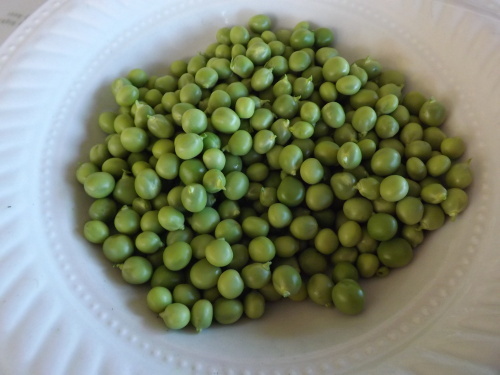 As for the peas, well the first harvest wasn’t very big. Once shelled I only had about a cup, just enough for Hubby and I to eat for dinner. They were so sweet and flavorful though, I really hope to get a lot more so I’ll have some to freeze for winter. For now that’s all we’ve been able to harvest, but more radishes are on the way and tons of peas are on the fences plumping up for picking, and for this I am — Simply Grateful. I cannot believe the weather we are having. It has been so hot and dry this spring/summer that even the lowest parts of our property are cracking from lack of moisture. This has never happened before, not in the 23 years we have lived here. My mornings and/or evenings are spent watering the gardens so they don’t shrivel up and die, and my afternoons are spent hiding out in the house out of the heat and humidity. My rain barrels have been empty for over a month, which goes to show how dry it’s been. I think we’ve had one day rain when I didn’t have to actually water. Otherwise there’s been a shower or two, but beyond that — nothing! The only good thing about being in the house is that I have been spending lots of time in the kitchen working on new recipes, organizing recipes I’ve photographed for blog posts, and trying very hard to actually sit down and write a blog post. Where does the time go? I’ve given up trying to answer that. Anyway, I finally figured out that since January I have photographed more than 70 new recipes I’ve worked on and HAVE NOT done blog posts on them! Playing catch-up is so out of the question that I don’t know what I’m going to do. Still, I refuse to admit defeat, so today I posted on Simply Grateful Cooking yet another new recipe I made, Bacon Cheeseburger Egg Rolls With Daly Sauce. Of course it was on a recipe I made today, but it also included a sauce that I’ve wanted to share since August of last year. A little old with the new, progress at any rate. Strawberry season opened up a few weeks ago and I did get out and pick about 20 pounds, so hopefully recipes will soon follow. For now, I’m waiting for the sun to go down enough for me to brave the heat and check on the gardens, and for this I am — Simply Grateful.